I received some Napoleonic reinforcements recently and I now how wargamers like to live vicasiously, looking at others toys so here I the unpacking of the Baccus 6mm reinforcements – Dutch Belgians along with a few Brunswickers. Just what I needed, more figures in the lead pile. At this rate I will live forever. The postman brought another book. 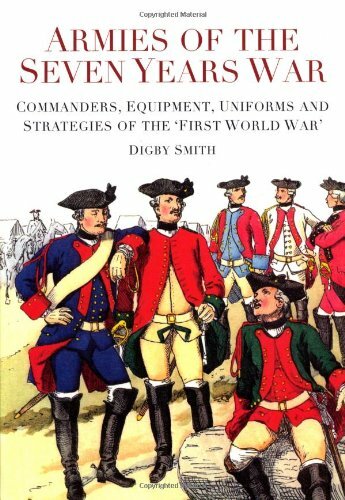 This time it was Digby Smith’s Armies of the Seven Years War: Commanders, Equipment, Uniforms and Strategies of the ‘First World War’, ISBN 978-075245-923-3. I have been looking forward to this one as well. Smith’s Uniform works are quite good and I have an interested in the Seven Years War that remains unsatisfied still – both at a naval level and a battle level. In fact, I have been pondering this war for the start of my own Imagi-Nations of that period, sort of like the Grand Duchy of Stollen. If not the Seven Years War period, then the Great Northern War or the War of Spanish Succession. Smith’s work is supposed to supply information on the senior commanders, uniforms, weapons, equipment, artillery, strategy, tactics and combat involvement (military and naval) of the forces engaged from 1756 to 1763. States covered include Austria, Bavaria, Britain, Brunswick, Denmark, Hanover, Hessen-Darmstadt, Hessen-Kassel, Holland, France, the Palatinate, Portugal, Prussia, Russia, Spain, Sweden, Wurttemberg and the Holy Roman Empire. He has attempted to cover the uniforms of the protagonists and given that some of them had large forces, I am not sure that he will be able to manage that in a work this size. I am ready to be pleasantly surprised however. There are over 150 illustrations and maps in this work. I will write more about this when I have had a chance to have a long look.